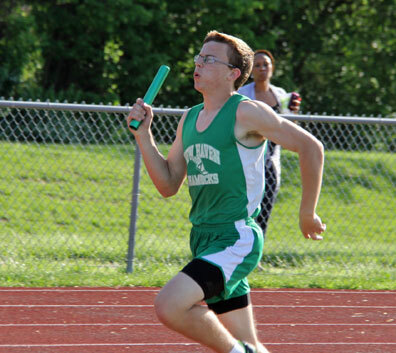 Pictured Keven McDowell running the third leg of the 4x800 meter relay. ST. CHARLES, Mo. - To say that New Haven’s 4x800 meter relay team (Zach Grater, Keven McDowell, Jon Stone, and Seth Schenck) has come along ways since last year’s seventh place finish at state, it would be an understatement. Not only did they win at Saturday’s Class 1 District meet, they set a new school record with a time of 8:28.53, breaking the old record, 8:29.2, set back in 2005. Seth Schenck continued his destruction, easily winning the 800 meter (2:00.58) and 1600 meter (4:31.43) runs to advance on to Saturday’s State Sectional Meet at Principia High School. 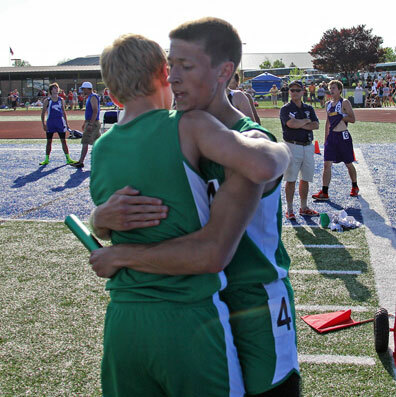 Jon Stone and Seth Schenck after winning the 4x400 meter relay. In the 3200 meter run Zach Grater (3rd) and Dominick Pataky (4th) will both move on to sectionals. New Haven’s first place finish in the 4x400 meter relay was probably the most surprising, seeing the fact the first time Seth Schenck, Keven McDowell, Alex Majors, and Jon Stone had ever run in the 4x400 was just seven days prior at the South Callaway Relays. Visit our Sports Zone for schedule of events and directions for Saturday’s State Sectional Meet at Principia High School.